Find out when THE REEFERS go head to head with THE REBELLES in a titanic clash to decide once and for all who holds the Secret of Surf. For one night only MEMO Music Hall will play host to a cavalcade of surf, turf, and sixties sensibilities to rattle the halls of Poseidon himself. Featuring the exotic oscillations of TRISNASARI FRASER and the wild style of RICHIE 1250, this promises to have hips shaking from the delta to the deep blue sea. THE REBELLES show us the way, through their original girl-group-greatness, combined with classics such as “The Clapping Song.” They’ve wowed audiences from Melbourne’s White Night to The Community Cup. SEE YOU UP THE FRONT! 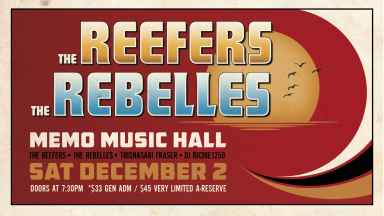 This is the only gig for The Reefers vs The Rebelles, better be quick!